At the invitation of Foreign Minister Wang Yi, Anders Samuelsen, Minister for Foreign Affairs of the Kingdom of Denmark will pay an official visit to China from March 11 to 14. China and Denmark are comprehensive strategic partners. The bilateral relationship has made all-round progress over recent years as evidenced by frequent high-level exchanges, constantly enhanced political mutual trust, in-depth growth of cooperation in trade, two-way investment that has become more active, and fruitful results in scientific research, environmental conservation, energy and other fields. People-to-people and cultural exchanges like the China-Denmark Tourism Year 2017 and fora for local governmental cooperation flourish. China attaches great importance to developing comprehensive strategic partnership with Denmark, commends the Danish government for its adherence to the one-China policy, and stands ready to deepen cooperation with the Danish side on the basis of mutual respect and win-win results. It is believed that the visit by Foreign Minister Samuelsen will add fresh momentum to the bilateral relationship. Q: From the end of February to early March, Chinese authorities for industry and commerce published the provisional approvals for nearly 40 Trump trademarks. Analysts say that it is quite unusual for China to grant a large volume of trademarks in such a short time period. A US Senator told my colleague that China is doing so consciously. It can be regarded as a special treatment to the Trump administration and is worth looking into. Do you have anything to say about that? A: I'd refer you to the competent authorities for the particular question you asked. What I can tell you is that the Chinese authorities in charge of trademark-related affairs protect the lawful trademark rights of trademark holders, Chinese and foreigners alike, and examine applications for trademark registration in accordance with laws and regulations. I will not comment on the speculative remarks. Q: Wikileaks has released documents saying that the CIA hacked a wide range of electronic products including those in China. Has China contacted the US about this and is China planning any response including a possible suspension of purchase of US tech-products? A: We are concerned about the relevant reports. 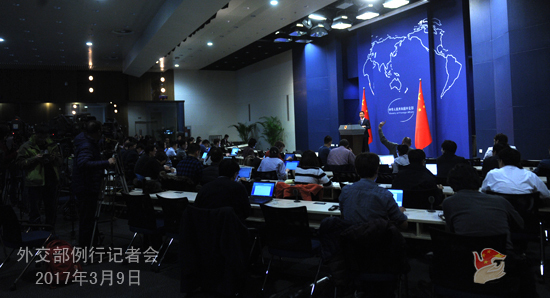 The Chinese side is opposed to all forms of cyber attacks, and urges the US to stop its wiretapping, surveillance, espionage and cyber attacks against China and other countries. The Chinese side is firmly committed to safeguarding its cyber security and is ready to enhance dialogue and cooperation with the international community to lay down a set of universally acceptable rules governing the cyberspace within the UN framework, and build a peaceful, secure, open, cooperative and orderly cyberspace through joint efforts. Q: The Philippine Defense Secretary said that Chinese ships had been spotted near Benham Rise or the Benham Plateau recognized by the UN as Philippine territory. The Philippine side called the actions very concerning. What is your comment? A: That is new to me. I need to check on that. 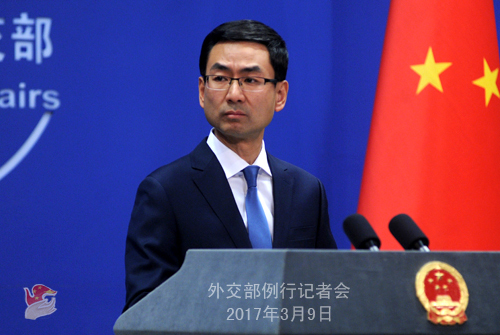 Q: Has the DPRK Ambassador to Malaysia left Beijing already and has any Chinese official had any contact with him? A: I took a similar question two days ago. Ambassador Kang Chol is waiting for his trip back to the DPRK. I have nothing more to offer. Q: At least 40 people have been killed and 70 injured in the attack on a hospital in Kabul, capital of Afghanistan. The Islamic State claimed responsibility for the attack. What is your comment on that? A: We are shocked by the terrorist attack and strongly condemn it. The Chinese side deeply mourns for the victims, and expresses sympathy with the injured and the bereaved families. We will stand firmly with the government and people of Afghanistan in their fight against terrorism to safeguard stability of the country and safety of the people. Q: What is China's comment on the eruption of conflict on the Myanmar side of the China-Myanmar border. Has China done any mediation work? It is said that tens of thousands of Myanmar residents swarmed into China for shelter. Can you confirm that? How will China help them resettle? A: Military conflict in the northern part of Myanmar over these day has caused heavy casualties. 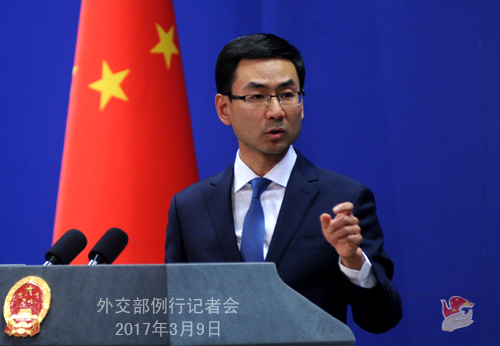 The Chinese side condemns the adverse impact it has inflicted on innocent civilians. So far, over 20,000 Myanmar residents have entered China to flee the fighting. The Chinese side has offered them proper accommodation and assistance in the spirit of humanitarianism, and taken effective measures to keep the border areas stable. The situation in Myanmar concerns peace and tranquility in its border with China. Highly concerned about that, the Chinese side calls on the conflicting parties to exercise restraint, stop the fighting so as to prevent the situation from getting worse and take effective means to restore peace and stability in the border areas. The Chinese side supports the peace process in Myanmar and hopes that parties concerned can peacefully resolve their differences through dialogue and consultation and press ahead with the peace process. Follow-up: According to reports, there is a Chinese hurt in the conflict. Can you confirm that and offer details about the incident? A: According to what I have learnt, stray bullets and shells from Myanmar have caused property damage to some Chinese border residents, and one has been hurt. Follow-up: What are the measures that China is gonna take to protect and ensure the safety of Chinese people living in the border with Myanmar? A: As I said, while providing humanitarian assistance to people from Myanmar, the Chinese side is taking steps to ensure peace and tranquility in the border areas. Follow-up: So the total number of people from Myanmar who are now seeking refuge in China is 20,000. A: There are indeed over 20,000 people coming from Myanmar to China to escape the conflict, rather than seek refuge. Follow-up: Is "20,000" the number of people fled to China after the outbreak of the conflict or over some period of time? A: That is the number of people newly arrived due to the war.